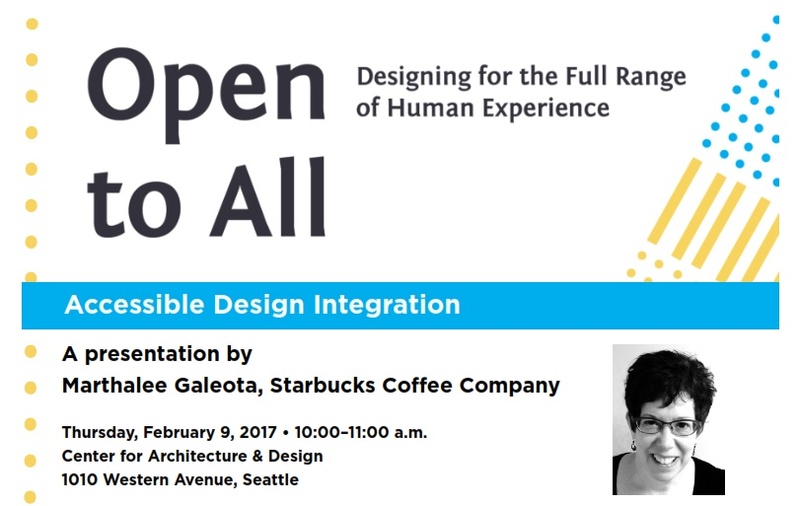 The Northwest Universal Design Council and community partners invite you to attend a special presentation by Marthalee Galeota, access and disability program manager for the Starbucks Coffee Company, in conjunction with the “Open to All: Designing for the Full Range of Human Experience” exhibit at the Center for Architecture & Design, which she helped to develop. Ms. Galeota leads Starbucks disability initiatives and strategic planning, collaborates with and advises business units on universal design and access, manages interpreter services, and designs and implements training programs on disability and access. Attend the presentation to learn how organizations can move beyond ADA regulations, make a broader commitment to human-centered design, and ensure a more meaningful experience for people of all abilities. View the exhibit before and after the formal program.